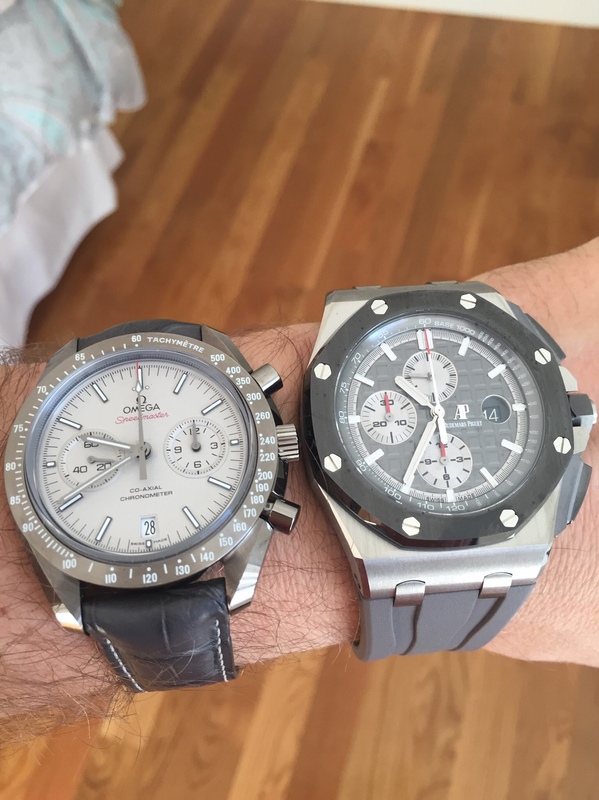 I have 6.5 inch wrists and wondering if I could pull off an AP ROO Chrono. 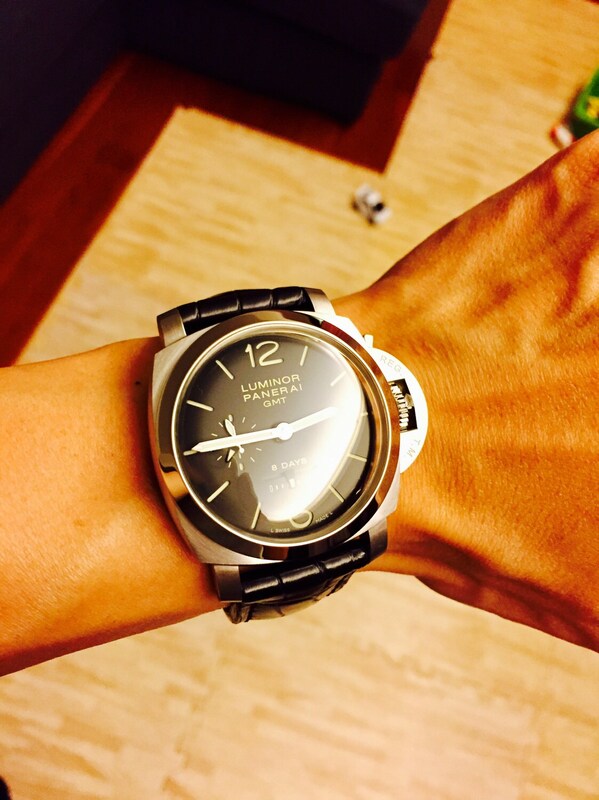 I have a PAM 233 which is borderline too big and I hears the ROOs wear a lot bigger due to the integrated bracelet. 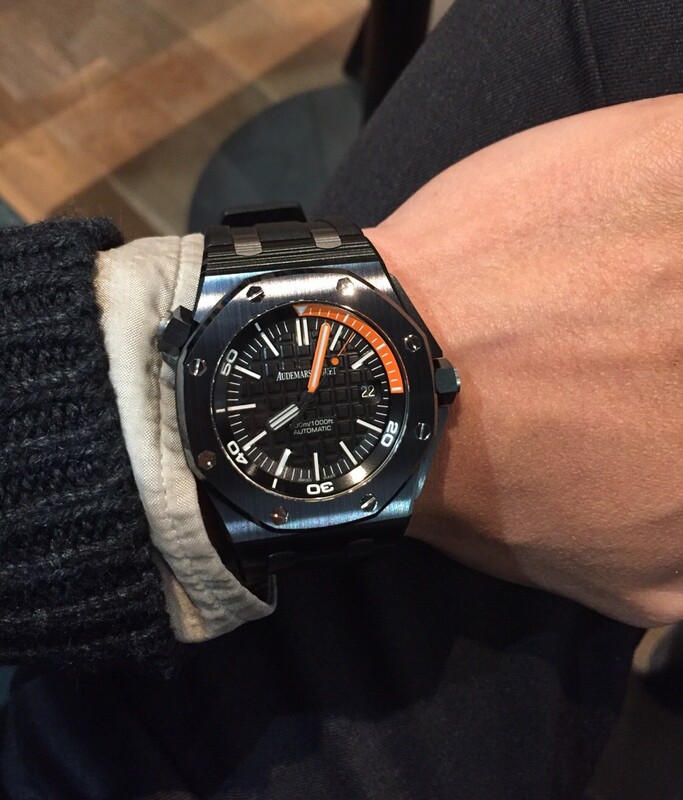 Do they also wear significantly bigger than the AP ROO Divers? Any members happen to have a 42mm and 44mm side by side photo? I attach a few wrist shots for your reference. Thanks as always and I would appreciate your comments and wisdom. Here is mine compared to a speed master grey side. You need to try one but judging how the 42 looks (good) on you I personally think that the 44 could be too big but try it as only then will you know. The chrono pushers on the 44 are what makes the watch so imposing but if you can pull it off I'd recommend it as it's a great watch. I agree with Ash, that looking at how the diver fits you its most likely the 44 ROOs will be too big, as they do wear quite a bit larger. Only way is to try one, but I think you should be cautious. I have circa 7" wrist and I'd say that's pretty much the smallest you'll really get away with. My left wrist is slightly above 6.5 and I feel is borderline though I do have option to wear on my right which is over 7. Think the 42 should be fine, it has a small dial so wears quite compact as opposed to the PAM which will wear large. Love the grey them you got going. Thanks for sharing! Thanks Ash. Your beautiful platinum ROO is what sparked the fire. As advised, I will go try one on. You should be fine with 42 but I find that it wears smaller vs my Pam 662, so I chose 44. Matter of personal preference, you can’t go wrong with either. A ROO on bracelet is not good for daily wearability. At some point, it will feel too heavy! But the 44 in ceramic or Ti are very easy to wear.